This section covers the period from 1952 to 1957 during which I was a pupil in the Abbey Grammar School in Newry. I know that I was lucky to get to grammar school, not having sat the 11+ exam in 1950 for a reason I have never fathomed. My mother saw to it that I sat the Review procedure, which came two years later. When I passed I remember going to the Education Board in Armagh with my mother for an interview with a man called Dickson who was later the Chief Education Officer for the County. I don't remember much about this but it seems to have been a necessary step in the process. One consequence was that when I started I was three months short of my fourteenth birthday, two years older than most of those who joined with me. To compensate, if that is the right word for it, I was small for my age and was no bigger than 5' 2' tall. In fact I shot up six inches in six months a year later. Neither was I very robust and ended up in hospital for six weeks in the winter of 1952/53. Whatever they gave me worked wonders for not only did I recover to rude health but I also grew taller! If I'd stayed longer I might now be 6'2'. I rose early on my first day at the Abbey. It was August 1952. We were living in Cregganbane, about a mile from the bus stop at Creggan crossroads and I had to walk it. The bus was at 8 o'clock. The day had a strange, fresh, adventurous feel to it. I was embarking on a whole new phase of my life. I didn't know what to expect as no one that I knew had been to grammar school before so there was nobody to ask. I remember being nervous and excited, full of anticipation and not a little fear. As I walked along the tree-lined narrow road, with deep shaughs on each side, a passing car struck me a painful blow on the right elbow with its door handle. The bugger was far too close and he must have known it. He must also have felt the bump but didn't stop. A great start to a new level of education! I rubbed that elbow for several days - lucky it wasn't broken. Apart from my lunch, my school bag was empty - for the first and only time in the following five years. I went light, I came home heavy - with books I couldn't read - Latin and Irish, as well as books on English Language and Literature, Poetry, Geography, Mathematics, Physics, Chemistry. There was a powerful lot of learning in that bag and very interesting to my mother, more so than to my father, but then she was an avid reader with an enquiring mind. That first day was strange; I didn't know anybody. The newcomers were too numerous for a single class and we were divided into two groups, A1 and A2. I was assigned to A2. We kept this structure over the years, progress to B,C,D and E. I have no recollection as to whether there was any rationale to the selection or if it was merely arbitrary. However, where one ended up had an effect on the subjects taken - for example, only A1 took French and A2 took Science. I always regretted not having the opportunity to study French, especially when a new teacher showed up in year three, the only female one (and French at that) in all the years that I was there. In those days the school was on Abbey Yard, at the bottom of Castle Street, not far from McCann's Bakery. We now know that within the structure of the Bakery was the shell of Bagenall's Castle, the stronghold of Sir Nicholas Bagenall who held the Lordship of Newry and who in 1613 was also granted the manors of Mourne, Greencastle and Carlingford by James I. The original castle had been built by John De Courcy and destroyed several times, including once by Shane O'Neill. Both the Bakery and the school lay within the grounds of a great Cistercian Abbey, of which no trace remains, set up in the late twelfth century. In 1850 three Christian Brothers arrived in Newry and set up the first school at Upper Chapel Street. Edmund Rice, who was born in Co Kilkenny in 1762, founded the Irish Christian Brothers, granted recognition by Pope Pius VII in 1820. As the numbers grew a new school, called the Carstands School, was built in Margaret Street. By happenstance I was later to work in that old building when for a period it was being used as a stand-in Local Office of the Ministry of Labour and National Insurance after its offices in John Michel place were bombed in 1958. The Abbey Yard school was established in 1903 and continued in use until 1966 when a new purpose built school was opened at Courtney Hill, a short distance away. The Abbey Primary School was opened in 1938, the year I was born. St. Colman's College, known throughout Ireland and beyond as Violet Hill, was founded as the Dromore Diocesan Seminary by Fr. J.S. Keenan in 1823. Our Lady's Grammar School was founded by the Sisters of Mercy in 1887 and remained in it Canal Street premises until the 1980's when it moved to new accommodation nearby. Sacred Heart Grammar School, established in 1930 by the Sisters of St. Clare. The school occupied its original site beside the Poor Clare Convent in Castle Street for 55 years. In 1986 it moved to a new purpose-built establishment at Ashgrove Avenue. There was also the Model School on the Belfast Road that was co-educational. Its pupils were all Protestants. The only occasion I ever met any of the pupils was as I remember, in 1956 or 1957 when we attended a film of "Hamlet", the play we were studying at the time. The Abbey School building was old with three stories, two rooms deep. The playing field adjoined that of the Sacred Heart Grammar School with a thick hedge between to keep us from sin, or the "occasion of sin" (a Catholic concept difficult to explain, but easy to get into). The wall of the stairwell, in the inner courtyard, served as a useful ball alley for the frequent games of handball. Of Castle Street, by 1990 only the East Side remained; the rest consumed by roads and roundabouts. Gone too was Mrs "Mingey" Keenan's shop, between the Abbey and the Bakery, where pupils would gather at lunch time for the odd cigarette that could be bought singly, sit in a store room and chat about the events of the day, or just watch the time passing. The teaching staff was a mixture of lay and clerical. When I started the Head was Bro. Reehill, from Co Cavan, very interested in football. During my time he was replaced by Bro. Magee, a large, easygoing bear of a man. I had little dealing with him except for the one embarrassing time, when several of us had to retract our over hasty "vocations" to the priesthood after listening to a particularly persuasive envoy from Maynooth College. Bro. "Minnie" Minogue taught English. I liked him, he was amusing, approachable and a first class teacher who instilled in us a love of poetry, and helped us appreciate the beauty of Shakespeare. Bro. Mullans, Bro. "Barney" Liston, who was forever swinging his keys. Then there was the "Doc", Bro. Doherty, the unpredictable, he of the fierce temper and savage application of the taws, not to forget the odd flying kick at the front desks, where the unfortunates had to sit, often quaking, during his classes. During my time I never had occasion to incur his displeasure or attract his animus - fortunately. And I made sure I was seated in the back rows of desks. Most of the lay teachers had been there a very long time and many of them retired within a decade of my last year. There was "Red Ned" McEvoy, Jimmy Heaney, "The Gut" Fitzpatrick, from Warrenpoint who had a painful trick of lifting one by the short hairs on the temples, "Todd" Sweeney, Paddy Crinion, Jimmy Haffey and the games coach, Gerry Brown. Gus Toremans, from I think, Belgium, tried to teach us music but all I got from that was "The Kerry Dances" and some verses from "The Ashgrove". Of my contemporaries (or within a year or two) I can't remember then all. 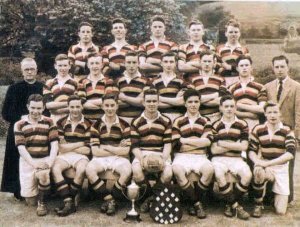 There was Frank Toal and Pat Toner (both Forkhill), Noel Loughran (Meigh), Joe and Hugh Murphy (Lislea), Pius Tierney (Lathbirget), John Campbell (Glenn), John Carr (Banbridge), Paul and Sean Tinnelly (Rostrevor), Colm McAteer (Dominic St.), Jim McCourt (Cornonagh), Gerry Doran (The Meadow), Tim Morrisey (Patrick St.), Jim Keegan (Culloville), Neol Gibney, Finbar and Aidan Conlon, Killian Higgins, Jim "Gunner" Brady, Seamus Mallon and Sean and Kevin O'Neill. In those days there were no GSCEs. The exam structure was fixed and demanding. At year three there was the Junior Certificate. Failure at this ended your grammar school career. At year five came the Senior Certificate. This required the achievement of a pass mark in at least eight subjects, which had to include English Literature, English Language and Mathematics. Finally, years six and seven were the Advanced Certificate, the entry qualification for University. Senior Certificate opened the way to teacher training should one want to follow that path. I quickly settled down to the different regime in the school and began to enjoy the experience. I found Latin to be a strange language and although I became quite good at it I never felt that it was a proper language and could never imaging it being used in everyday life. I never saw the point in it. Irish on the other hand I liked well enough. We had a book for the last two years called 'Na Rossa go Brath' which was about the lives of simple fisherfolk in the Rosses area of Donegal. I became quite caught up in their lives, especially in that of the patriarch Padraig. Sadly I threw the book away on my last day in the school and abandoned the language too. I liked science but hated organic chemistry - I could not grasp this at all. Despite this I managed to get a Credit in the Subject in the Senior Certificate. My best subjects were English and Mathematics. I had always been an avid reader (I got this from my mother who always had her head stuck in a book) and developed a fondness for poetry that has remained with me throughout my life. In the main my school days in the Abbey were uneventful. I was not into sport, although I did participate in games, and the school's main focus was on football. In my second year the school, for the first time, won the McRory Cup and there was huge rejoicing in the town as well as in the school. They won it again in 1959, two years after I left. It was during these years that I started smoking. The habit developed slowly, mainly because I had no money to buy cigarettes - just the odd single fag purchase in Mingeys. Of more importance was the fact that for a couple of years my sister May was working as a Nanny for the Malocca family who owned the Florentine Cage in Hill Street. She would let me have the odd unfinished packet of duMaurier cigs. It was a habit I tried several times to kick before finally succeeding at the age of 37. It was while she was working there that May met her future husband Jim Treanor, a fine man and a great friend - he was to be my Best Man at my wedding to Sadie. It was the time of trouble in the Congo; Patric Lumumba had been murdered by a rival tribe, the Balubas. Frank Toal said to me "Did you hear what happened to Patrice Lumumba", "No" I replied, "He was hung by the Ballubas". Ha Ha, I thought this was great and that I should pass it on so I asked Bro. Leeson "Did you hear what happened to Patrice Lumumba? ", "No" said he, "They hung him by the Ballubas" - boom boom - aaargh. For the most part my contemporaries were a conventional bunch; this was before the rebellious sixties. Myself and Colm McAteer did mitch a few times in the summer of our fourth year to cycle to Warrenpoint for a swim. I was not much of a swimmer. Living inland I had few chances for sea swimming and had "learned" to swim in the Creggan River, which was a small river with only a few pools deep enough and those that were available were only a few yards across. So I was not prepared for the first swim we did - to a moored boat about 100 yards out in the direction of the Gunnaway Rock. I never knew 100 yards to be so far. As we swan, or in my case trashed, the boat got no nearer but the shoreline got further away! I was exhausted and pretty scared by the time we reached it and Colm had to help be on board. Going back was easier as I could see the shore. That experience put me off swimming for a long time although years later I took it up again on a regular basis and eventually was able to do a five-mile swim for charity. During the summer breaks I got jobs for local farmers, among them Hugh Largey and Felix and Kevin Burns, and the "Fep" Lavelle. I'm sure it must have rained now and then but I can only remember golden days, hard but rewarding work, warm sun and drifting clouds, scented fields of hay and oats, sheaves to bind and stooks to rest against, good companions, great craic and banter, hot tea and cold buttermilk, singing twilight and peace at the end of the day - and a few shillings in my pocket for the pictures and the dances. Ah - the dances. My first dance was in Malachy Traynor's Hall at Creggan crossroads. Before the present line of the Cross/Newry Road was opened in the 1950s the road ran past Malachy's public house, one road forked to Glassdrummond and the other to Cross. Just on the Glassdrummond side was the Hall, opened only in the early 1950s. Such an exotic place was beyond my experience. I was fourteen and mesmerised by the music and the glamour. Somehow I gathered enough for entry and although I had no idea of how to dance I asked a girl up. It so happened that she was a German girl, in service in Paddy Murray's and couldn't speak much English. Of course I had no German so communication was non-existent. I walked all over her feet and staggered my way round the floor, pulling the poor girl in all directions and cannoning into other dancers who shoved me away. As well as all this she was taller than me and much heavier, making her difficult to steer at the best of times never mind that I hadn't a clue about the steps or the rhythm. Talk about teaching McFadden to waltze! Needless to say that was the last dance I had that night - there were no more takers. Traynor's was my father's local, just 200 yards from the house. With his friends Peter Burke, Barney Keegan and Fep Lavelle they sorted the issues of the day and discussed racing form. Malachy was a local councillor and well respected local character. Working on the farms, six days a week - in the good weather until dusk - made me tanned and healthy and I remember thinking to myself that when I left school I would get a job out-of-doors. Lucky my experience was not in the bleak mid-winter or I would surely have had a different inclination.